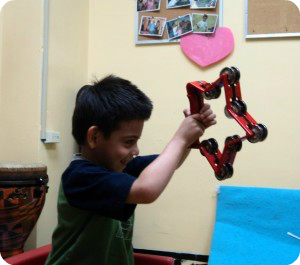 Music therapy intervention: Therapeutic Instrumental Music Playing (TIMP) with tambourine. During this intervention the music therapist sings an original song. 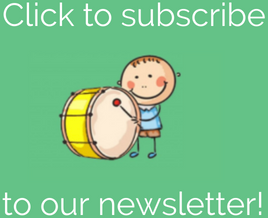 The lyrics, meter, and rhythmic beat of the song cue the child to move the tambourine up and down. This provides the child with multiple opportunities to fully extend his upper extremities above his head. 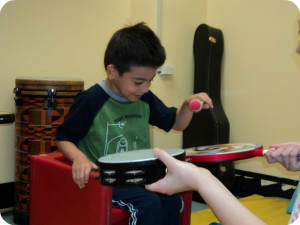 Music therapy intervention: Therapeutic Instrumental Music Playing (TIMP) with drum and tambourine. During this intervention the music therapist sings an original song. The lyrics, meter, and rhythmic beat of the song cue the child to fully extend the upper extremities in front of him to alternate playing the drum and tambourine. Both instruments serve as targets to provide auditory feedback when the movement has been completed. The instruments can be moved to the side, up high, or down low, to facilitate crossing midline and work on range of motion.